Technology makes our modern lives possible – without it, after all, you wouldn’t be reading this right now. But technology can also make our lives better in less tangible ways. These 10 art projects all use technology in different ways to create some of the most compelling, unique art the world has ever seen. Artists from the MakerBot community converged recently on New York’s Metropolitan Museum of Art with a single purpose in mind: to record every inch of some of the museum’s most famous sculptures. 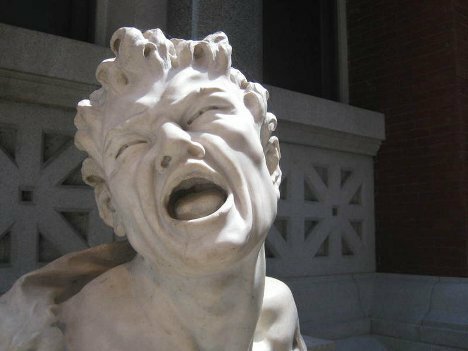 The goal of the project was to make 3D maps of the sculptures that could then be translated into downloadable designs and reproduced at home with the use of a 3D printer. Thanks to the amazing futuristic properties of the 3D printer and the dedication of the MakerBot community, priceless works of art no longer have to be relegated solely to the world’s museums. Deep in the desert of Tunisia, a striking sight was recorded in January of 2012: the city of Venice had somehow been transported to this barren landscape. It was all thanks to a German design team called Visual Drugstore; they loaded up hundreds of pounds of equipment into their massive offroad vehicles and set out to transform a natural formation in the middle of the Sahara. 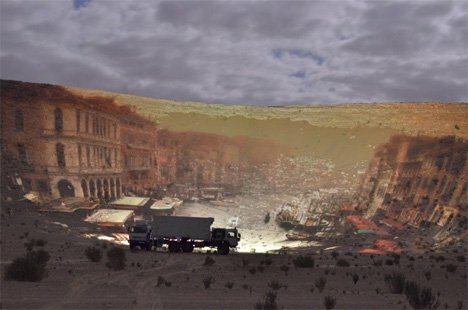 Using special projectors, the team “painted” the city onto sand and rocks, bringing an unexpected bit of the bustling Mediterranean city to the desert. 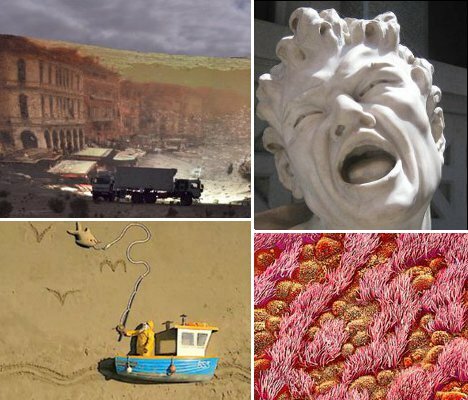 Stop-motion films can be made using just about any objects, and these unusual films prove that. They were both filmed using Nokia N8 smartphones and some very unconventional materials. The first, a huge project called “Gulp,” was made on 11,000 square feet of beach using a full-size boat and a full-size human. According to the team behind the effort, it is the largest stop-motion film ever created. The other film, from the same creative team, is the world’s smallest. “Dot” features a 0.35-inch tall model of a girl printed on a 3D printer. The filmmakers had to use a special cell phone-mounted microscope to see and record the itty-bitty action. Scanning electron microscopes capture an incredible amount of detail from even the tiniest of objects. Japanese microscopist Susumu Nishinaga has an uncanny talent for finding and recording some of the most breathtaking SEM images ever seen. 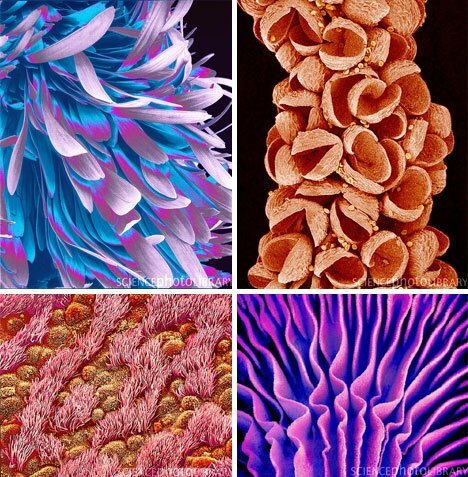 Mundane objects like feathers, beetles, flowers and mushrooms become ethereal works of scientific art. 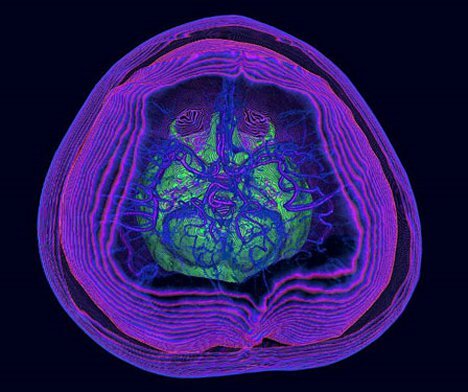 A Hong Kong radiologist named Kai-Hung Fung creates similar images using the human body and a CT scan machine. The graceful shapes and curves within the human body are elevated to masterpiece status once photographed and colored by Fung. Although some of the images depict diseased and dying tissues, the artist’s treatment of the subject matter reveals the beauty even in the end of life. Weather data is not usually among the scientific pursuits that we consider beautiful, but artist Nathalie Miebach adds a unique spin to this mundane subject. She observes changes in weather data, plots them out, and then turns those observations into three-dimensional art. The data are plotted out and represented truthfully, meaning that if you know Miebach’s method you can actually interpret the weather from the time period represented by any of her pieces. 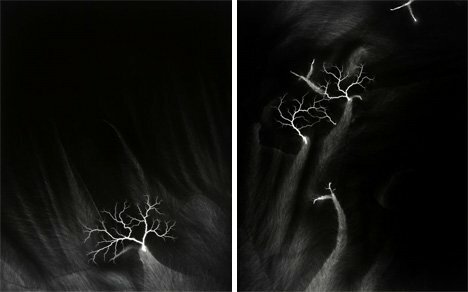 Hiroshi Sugimoto‘s “Lightning Fields” series uses 400,000 volts of electricity, a metal table and photographic film to capture raw images of the power of lightning. The electricity passes through the film, creating incredible images of pure power. The finished pictures tend to look like alien landscapes or even novel living organisms. 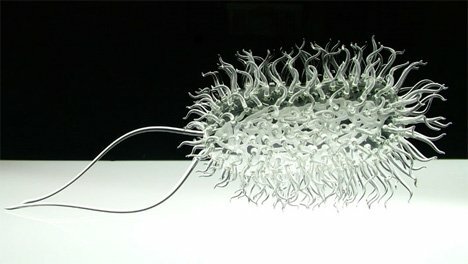 British artist Luke Jerram does the seemingly impossible with his pathogen sculptures: he makes potentially deadly organisms seem fragile and lovely. His “Glass Microbiology” series captures the unexpected beauty in nasty germs and viruses, turning them into delicate glass sculptures roughly one million times the size of the actual pathogens. Sculptor Forrest McCluer creates similar sculptures, but with vastly different materials. Instead of glass, he uses discarded computer parts to recreate deadly viruses. 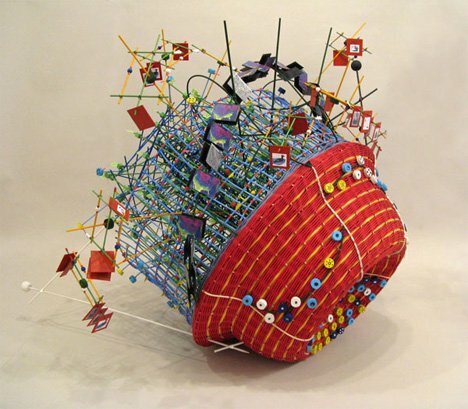 Above, a scientific image of the AIDS virus (on the left) is faithfully recreated in a sculpture called “Wilco Toroidal,” created using toroidal inductors found in the power supplies of discarded computers.